We have been following your blog and we have found a lot of useful information in it. We have an innovative storage product we would like to send to you. 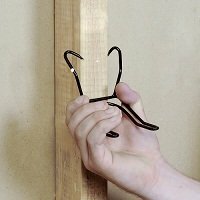 The Bat Hook grips into studs, rafters, joists and other exposed wood surfaces. It does not require any tools to install or remove. It can clamp at any angle. It can hold up to 40 lb. The Bat Hook appears to be a very simple, yet innovative product. Based upon the description given by the product coordinator, Cecil Sibanda, the Bat Hook can hold 40 pounds of weight which is obviously 100's of times it's own weight. Really good structural engineering based upon a form determinate type of structural element. This product is obviously very useful considering it can be attached at multiple angles to a wall stud, ceiling joist, or floor joist in your home. Join in and write your own page! It's easy to do. How? Simply click here to return to Garage Storage.